I really like the second pot. I think its neat how they took a lot of the clay out, but the pot retained its structural rigidity. I like image number 3 because of the details in the coils. Image 5 is my favorite because of the authentic pictures and shape of the vases. I like the second one because it is both even and odd. 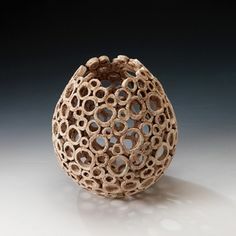 Its holes are in odd number, but its shape is even. I like the way the vase is shaped and the color coordination. I like the third one because of its detail and the cool design that it has. I like the second one because it's unique and different than the other pots. I like the second because of the time it must have taken to make each individual ring. I like the fourth pot because the coils don't continue in a straight line. I like the second one because it is a lot of individual circles put together and it looks unique. I like the one with the holes. It intrigues me because it doesn't look like the foil method. I like the one with the squid. It is very artistic. I like the last one because i like the shape or the pot and the octopus. I like the first pot because I like the shape and designs engraved on it. I also like the shininess of the surface of the pot. 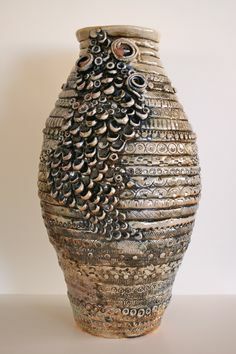 My favorite is the third pot because the different textures and designs make it unique. I like the second pot because it looks like itd be hard to keep from falling apart. i like how the artist made the octopus pot but also how they incorporated that much detail. i like the second pot made up of a bunch of circles. I liked the octopus pot because octopuses are really chill and it's a lot better than what I can do. My favorite one is the first one. I like how the designs are very detailed.